This book focuses on the crises facing Al Qaeda and how the mass killing of Muslims is challenging its credibility as a leader among Islamist jihadist organizations. The book argues that these crises are directly related to Al Qaeda’s affiliation with the extreme violence employed against Muslims in Iraq, Syria, Afghanistan and Pakistan in the decade since 9/11. Al Qaeda’s public and private responses to this violence differ greatly. While in public Al Qaeda has justified those attacks declaring that, for the establishment of a state of ‘true believers’, they are a necessary evil, in private Al Qaeda has been advising its local affiliates to refrain from killing Muslims. 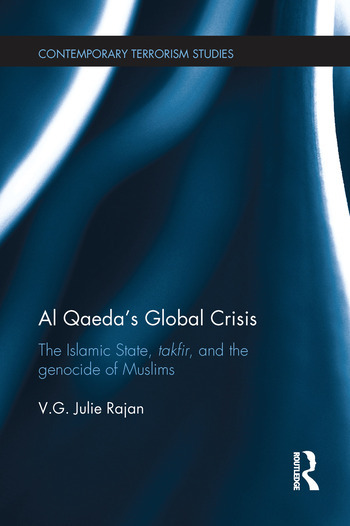 To better understand the crises facing Al Qaeda, the book explores the development of Central Al Qaeda’s complex relationship with radical (mis)appropriations and manifestations of takfir, which allows one Muslim to declare another an unbeliever, and its unique relationship with each of its affiliates in Iraq, Syria, Afghanistan and Pakistan. The author then goes on to consider how the prominence of takfir is contributing to the deteriorating security in those countries and how this is affecting Al Qaeda’s credibility as an Islamist terror organization. The book concludes by considering the long-term viability of Al Qaeda and how its demise could allow the rise of the even more radical, violent Islamic State and the implications this has for the future security of the Middle East, North Africa and Central/South Asia. This book will be of much interest to students of political violence and terrorism, Islamism, global security and IR. V.G. Julie Rajan is Assistant Professor in the Department of Women's and Gender Studies at Rutgers University, USA. She is the author of Women Suicide Bombers: Narratives of Violence (Routledge 2011).